Paris Jackson revealed her inner-geek after enjoying a day out with her brothers at a Los Angeles comic convention. 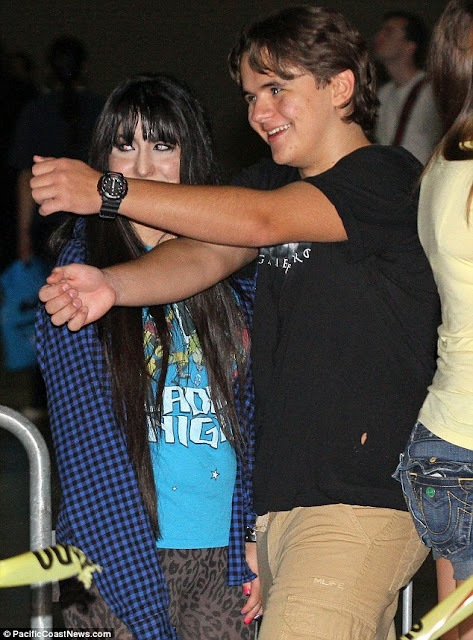 The 14-year-old daughter of late pop icon Michael Jackson stepped out in a yellow top and denim hot pants as she attended Stan Lee's Comikaze event on Sunsday. Flanked by a crew that were the filming the family during their day out, Paris seemed happy as she walked through the bustling crowds at the Los Angeles Convention Center. Comic book fans, games and zombie enthusiasts descended on the pop culture event over the weekend for the annual festival, which is now in its second year and has been re-branded Stan Lee's Comikaze after the comic book creator became a business partner following last year's success. 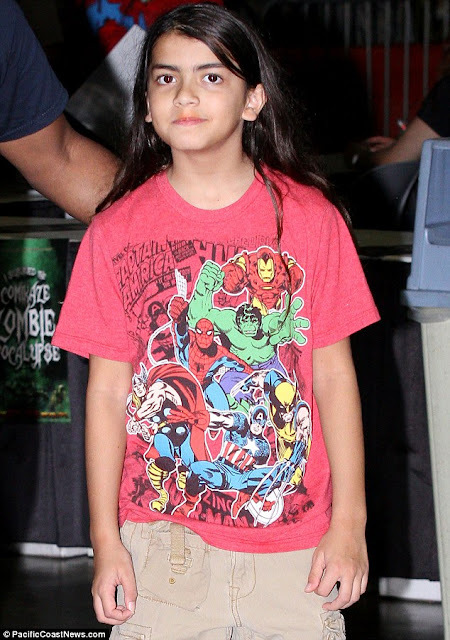 While Paris and her older brother Prince Michael didn't dress up for the occasion, ten-year-old Blanket got into the spirit of things by wearing a red T-shirt featuring several Marvel comics characters that Lee created, including Spider-Man and The Hulk. The Jackson children inherited their comic book loving side from their father. Michael was a huge comic book fan and purchased a host of geek goodies, including life-size statues of Spider-Man, Superman and Batman, as well as vintage X-Men and Marvel Vs Capcom arcade machines. The King of Pop also struck up a friendship with Stan Lee in his failed bid to buy the screen rights of Spider-Man. Lee recounted their meeting in a 2009 interview with MTV: 'I had been to his place in Neverland ... and he wanted to do Spider-Man. I'm not sure whether he just wanted to produce it or wanted to play the role, you know? Our conversation never got that far along. Paris has also inherited her dad's acting desires. In a new interview with Glamour, she says she's desperate to be an actress and has the backing of her Aunt La Toya. Paris said: 'She really does encourage me; it’s just awesome of her. I love my dad, and I’m proud to be his daughter.